Standby Power is a form of back-up power intended to protect critical applications from mains power failures. The most common form of standby power is a generator set and for their installation clients tend to turn to standby power specialists like EcoPowerSupplies. When planning the installation of standby power generating sets there are a number of factors to consider. Firstly a standby power generator is sized in kW (Real Power) and must be sized to match the load it is to power. If the generator is to supply a downstream uninterruptible power supply the generator must be oversized to accommodate the UPS efficiency and synchronisation requirements. Runtime and fuel are the next considerations. Most generators will operate from an 8-hour day tank which may be built into the set or connected nearby. The generator fuel tank will be bunded or double-bunded to protect the local environment. If the fuel to be used is not diesel, natural gas or liquid petroleum gas are good alternatives and these will be stored or supplied locally. Most generators are situated outside a building and this will require a concrete plinth or similar structure for the generator to sit on. Noise and exhaust fumes must be considered in relation to the local population and environmental legislation. Most generating sets are housed in weather-proof enclosures which also provide noise attenuation but this must be suitable for the limits for the surrounding area. Two further important aspects of the installation will be the use of an Automatic Transfer Switch (ATS) and a Control Panel. The ATS transfers the load between the mains power supply and generator output. Control of the generator is achieved with a manufacturer dependent control panel. Not only will this monitor and control the generator but it may also provide for remote alarm reporting. A generating set is not a fit and forget item. Standby Power Specialists like EcoPowerSupplies also provide a range of additional services to ensure the generating set is always ready to act and support a critical load. These services include preventative maintenance visits and refueling. Most generators will require one or two preventative maintenance visits per year to check on fuel and lubricant levels, replace consumables, check the starter battery and make sure the generator is operational. Of course refueling is another important aspect to consider. Generators should be tested at least once a month to ensure the set is operational. This will use fuel and especially if the set is for 30 minutes. If a site does suffer a prolonged mains failure, refueling may be critical to the overall resilience of the generating set. 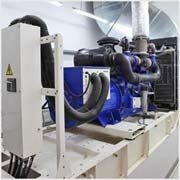 Whilst the above has covered the general aspects of a generating set it is important to note that standby power specialists must also look at the overall project itself from a logistics and electrical installation point of view. Most standby power specialists will offer a free site survey and this is recommended to make sure the right standby power proposal is presented for client consideration.